A vegan buddha bowl is what I often have for lunch. 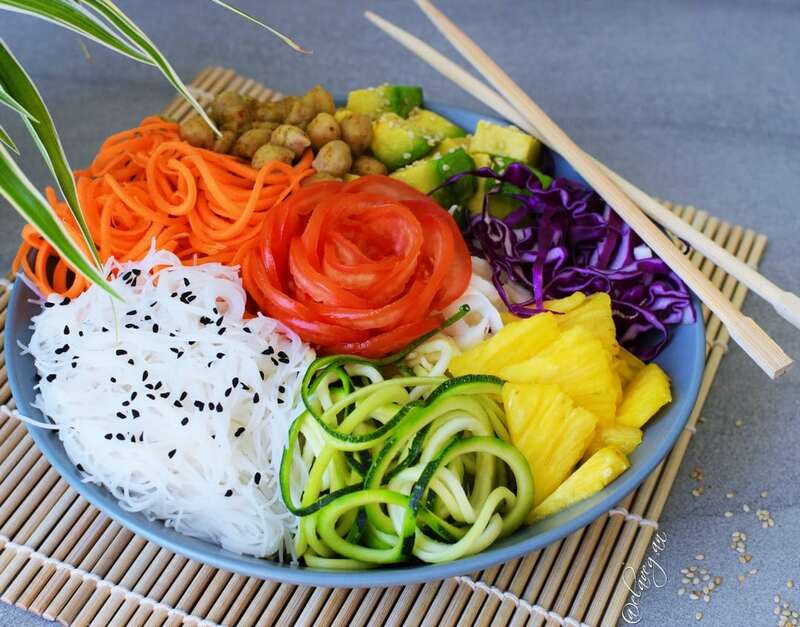 Wait, you never heard of the term “Buddha Bowl” before? 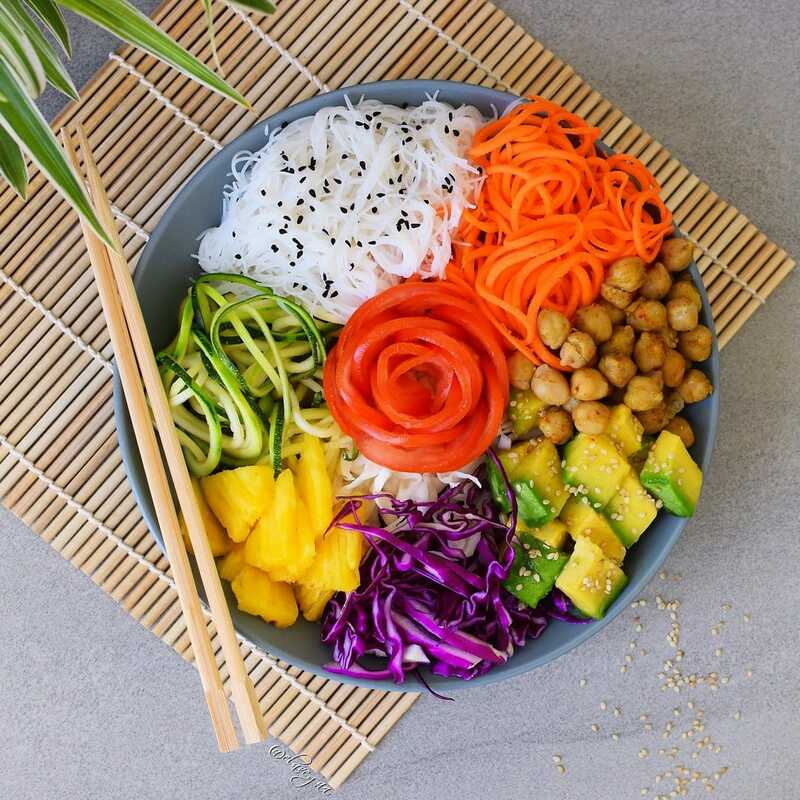 “It’s a bowl which is packed so full that it has a rounded ‘belly’ appearance on the top much like the belly of a buddha.” Buddha bowls are a perfect lunch as they combine raw veggies + greens with cooked veggies, legumes like beans, chickpeas, lentils which are rich in protein and you can also add grains like quinoa or starches like rice, potatoes, noodles etc. You can also add nuts and seeds and a delicious dressing. 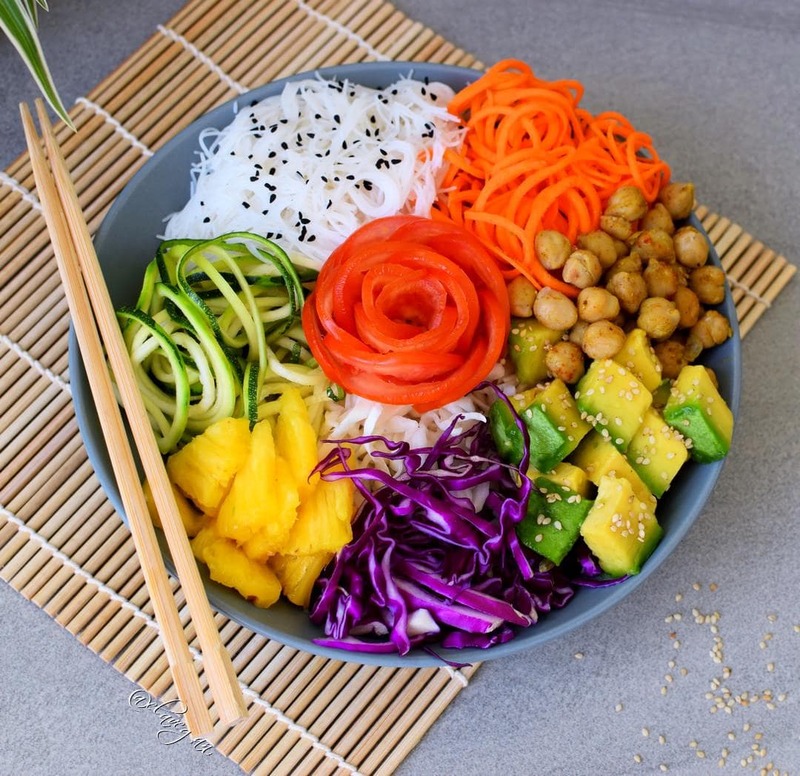 Buddha bowls are packed with many vitamins, minerals, antioxidants and fiber, they are filling, easy to make and furthermore healthy and delicious. 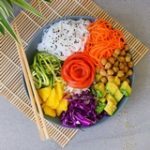 Which ingredients are in my vegan buddha bowl? I often check which veggies are left in my fridge and just throw everything together in a bowl. Sounds easy right? I like to eat the rainbow, so I add lots of colorful raw plants like tomatoes, zucchini, carrot, red-, and white cabbage, pineapple and avocado. Pineapple? Yes! It’s a must in savory food, just think about Pizza Hawaii. To this buddha bowl, I also added roasted chickpeas and rice noodles. I fried the chickpeas with a tiny bit of coconut oil, some curry powder and also a pinch of smoked paprika. I love to eat my vegan buddha bowls with a delicious avocado lime dressing but you can, of course, use any dressing of choice. If you haven’t tried out a buddha bowl yet, then you have to give it a go now because buddha bowls taste really tasty. Blend the ingredients for the avocado lime dressing in your high-speed blender or food processor and pour it over your buddha bowl. Enjoy! Seriously, this is absolutely beautiful. I hope you dont mind that I shared this on my Facebook. I just can’t get enough of these buddha bowls and this one stood out to me above all others. Thank you for sharing this recipe! So simple and healthy and we all loved it. I am so glad you liked my recipe, Emilija. I can’t eat avocado. Any suggestions for an alternative dressing that would suit this recipe? Thanks!